"The starting points for The Fairytale Recordings are eight earlier works from which writers — Tom Morton, Lili Reynaud Dewar, Mick Peter, Ina Blom and Tacita Dean — have created lyrics to reflect their spirits. Their titles are poetic, invoking dark magic: Ghost, Black Hole and Vice De Forme (A Duel of Warriors) for instance. 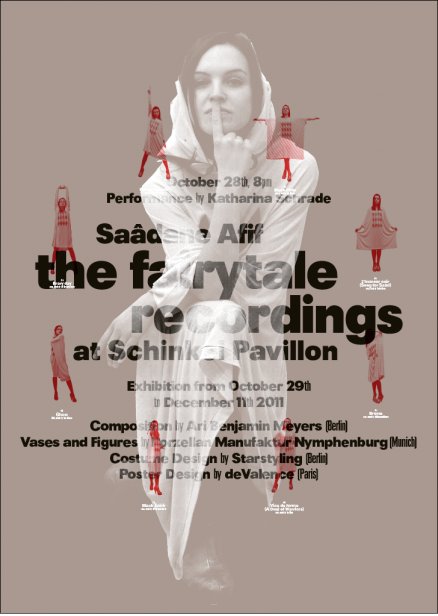 From these, Afif has worked with the operatic actress Katharina Schrade and composer Ari Benjamin Meyers, turning each text into a performance in which the words are part spoken, part enacted, thus creating a transmission of the text that ends with it being sung into a special vase which is then sealed consigning the verse to eternity. Afif employed the world-famous Munich Porzellan Manufaktur Nymphenburg to make the eight vases. Each bears a different figurine on its lid depicting Schrade in the pose that she will begin each performance with and the recording information for each work — a reference number, the title of the song and the date. 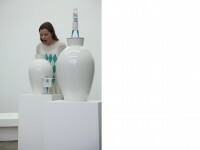 Afif's collaborators are each important — the writers, actress, her costume designers StarStyling Berlin, and the vase manufacturers —chosen to imbue his piece with their particular savoir-faire. The idea for the work harks back to pre-Edison notions of sound recording, to literary conceits encountered in works by pre-Enlightenment writers such as François Rabelais which imagined the possibility of freezing the spoken word, and to the animist principle that non-human entities might embody spiritual life-force."